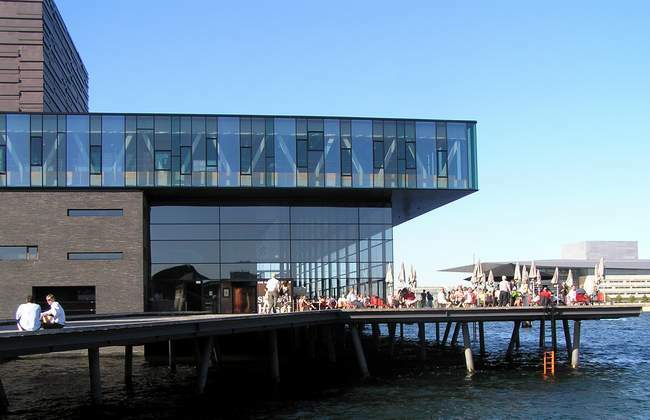 The new Opera House, built in 2003 just across the water from the city center. 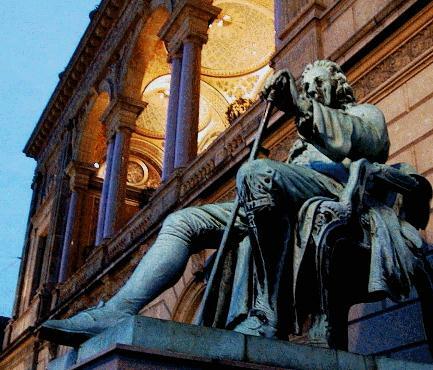 A modern venue for operas, ballets, concerts-- y'know, lotsa arté 'n' stuff like dat for ya. 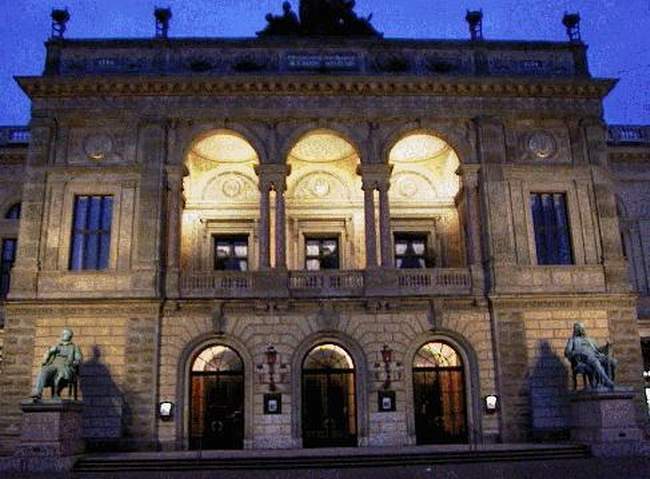 Det Kongelige Teater, the old Royal Danish Theater on Kongens Nytorv; once the only place to go for theater and opera, now looking for a new role to play. Ludvig Holberg (1684-1754), the "Shakespeare" of Denmark, wrote most of the classic Danish comedies & plays performed in det Kongelige Teater. 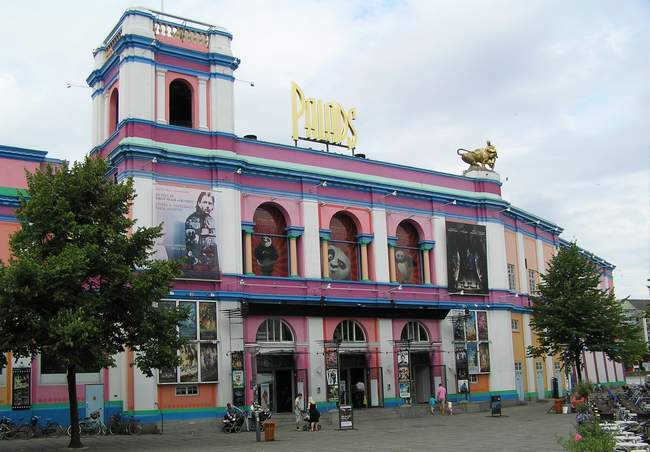 Palads Movie Theater. One of many in Kbh. Movies are popular here of course, and there is always a selection of Danish and other European films to compete with the American blockbusters. Note : foreign films (like American) are not dubbed in Denmark, but undertexted, original language always intact. Most larger European countries dub in their own languages--French, German, Spanish, etc--which ruins the artistic integrity of any film. Scandinavia and Holland don't do it, so a traveller can enjoy many films in these countries. Being countries with small language pools, they tend to become familiar with other languages anyway. This is my favorite comic book store, where I can keep in touch with the super-hero universe and its commercial market, being a comix artist myself. 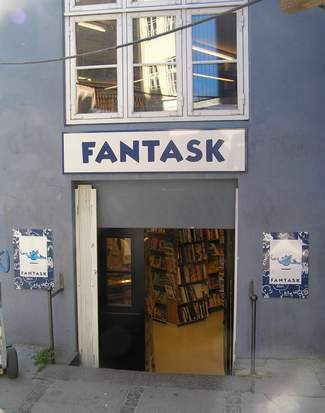 Fantask has most of the mainstream American and British stuff in print: Marvel, DC, Dark Horse, ABC, Image; in English or Danish. They also have most of the popular large-format French/Belgian comic albums in Danish translation: Hergè, Cothias, Burgeon. And of course, Japanese Mangas. We're talking about REAL Culture here. Free theater in the park called Kongens Have. This one's for kids. Ever heard John Wayne say: "Ein mann macht was ein mann machen mussen"? Or Toshiro Mifune say "Merde" instead of "-shaw!"? The only time I ever saw "My Fair Lady" was when I was a GI in Germany...I still remember how "woverly" was translated as wunderschön.